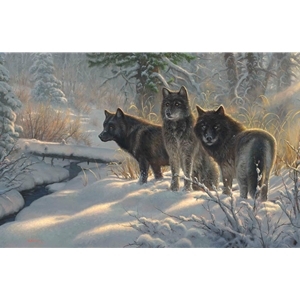 In my first wolf painting “Valley of Shadows,” I wanted to depict how we can lie down in the midst of danger and rest because we are being watched over by God. In my new painting, “Three Amigos,” I want us to see past what appears dangerous and look in their eyes.The first looks hungry, the second looks worried and the third looks defensive. Sometimes we forget our battle is not against flesh and blood.We need to look past the “problems” that people pose in front of us and see the longing and emptiness that cause this defensiveness or the attacks on us. Everyone standing before us has a past and a history - they have turned out the way they are because of it, and they just need some love.They, too, need to be a part of something for good.